70% of Dexter's Wardrobe is from The Children's Place (because they are too awesome to pass up) and the other 30% are 100% organic tshirts and pants. I try to make sure there is always a layer of organic under anything else. Mostly because I do not want any formaldehyde leaching into Dexter's skin. That, and because it is so soft. I recently had the pleasure of reviewing an awesome new company, Squishy Fish. Who is Squishy Fish you ask? Well, Squishy Fish is a Canadian owned and operated baby and toddler clothing company that blends eco-friendly fabrics with creative, stylish design. All of their shirts are made with unbleached, 100% organic cotton. Oh, and they are down-right delicious too. I love that all of their designs are kid-inspired and undeniably cute. 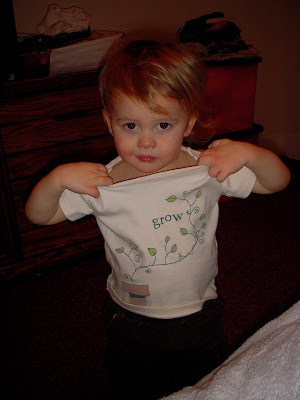 I chose the Grow shirt for Dexter because he not only grows like a weed but because I like to think that it is me, my mother who helps him to grow. Like a plant, I give him nourishment and water and I tend to him daily. I bring him outside for fresh air and sunlight and I take him in when it is too cold. I love watching him grow and each day is full of surprises. Here's that little stinker now showing off his Squishy Fish duds! Squishy Fish not only sells Tshirts but they also sell pants and blankets too. Squishy Fish designs are available in tees or onesies. Onesies are available in sizes 3-6m, 6-12m and T-shirts are available in sizes 12-18m, 18-24m. Every piece is made with 100% organic cotton and get this, the snaps on the onesies are nickel free! YEAH!! 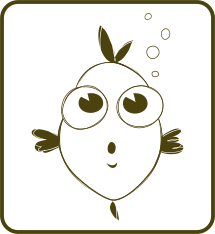 Thanks to Mel, the owner of Squishy Fish, you will get to win your very own perfectly-plush organic tee or onesie! I woujld like you to head over to Squishy Fish and pick your favorite item. Come back here and tell me what it is that you would like to win. Leave your email address or I can't notify you if you win. I would love to win the Squishy Fish (the original design with the actual fish and bubbles on it) t-shirt in size 18-24m. Those are some really cute designs. I also like the Squishy Fish t-shirt in 18-24 mos. It would be great for my little nephew. So cute! Thanks! I found your site on Prizey. I entered the BARBAR hair dryer giveaway. I entered the Jolly Llama giveaway. I entered the Triaminic giveaway. I entered the Skin MD giveaway. I love the "squishy fish" onesie! I love the Dream onesie. I can't remember how I found your site, it was ages ago, and I have been following for a long time too! I entered the Azfasst giveaway. I would love the squishy fish T-shirt is size 18-24 months, all of the designs are so cute! I like the imagine tee. Found your site at twitter. Also entered the Head Organics Giveaway.